The indwelling spirit in this body is the ever-present witness/awareness, the director, the sustainer and the enjoyer---the great Lord and the Supreme-self. As you cross this threshold, notice that your identity does not disappear. Even with no image to look at and no body, you remain what you really are---viewing awareness that stays the same even though the scenery of your life constantly changes. This is your identity as awareness, a lively, wise alchemist who stands unattached, behind the constant show of transformation. Life is a joyful bundle of experiences if we firmly decide, with full awareness, for this bundle to emerge from the connection with Inner Power of the Self. Remembering, however, that the Enjoyer in us that makes us truly enjoy these experiences is different from the roles we perform. It is also different from the vehicle we use to perform these roles. Hence the key to enjoy our roles is to perform them from the inner connection as directed from the Self within. Also remembering that the inner power of the Self is not different from the infinite sustaining power of the Source that orchestrates the dance of the whole universe. As it exists everywhere like butter in the milk, and whose very nature is the true and pure experiencing of the present moment as Is (not as what it should be). The first step is to understand the wholesomeness, the lower nature, the higher nature of the Self and its connection to the Universal Self/Energy/God as the sustainer/source of the whole universe. This awareness in itself is self-empowering. It is now a matter of establishing oneself in this mode, performing all one's activities from this connection, enjoying them and freeing oneself from attachments of various outcomes. This is all possible, as shared in the earlier LRIG monthly themes. However, it requires openness, non- judgment, determination and self-effort to keep moving in this direction. Once there is a deep yearning for this fresh start in life, it is the beginning of a new life of truth/freedom, awareness and joyfulness (an experience of love, peace and bliss). All of us are entitled to this new beginning. Without this working awareness, the worldly situations can drive us crazy. Being in touch with the Higher Nature of the Self automatically makes us keen observers of every situation. As soon as the inner observation is completed, the awareness clicks in. Therefore, it is only a matter of motions that an aware person goes through outwardly in a fashion that people around can understand him/her. With this mode, one can look at the state of the world with amusement. - Manifesting/Co-creating the established goals/aspirations from the inner-connection through one's unique ways such as silent meditation, prayer and surrender, etc. Getting the relevant directions from the Higher Self (spirituality) and using the body-mind-intellect (rationality) as directed from within...unified approach of spirituality and rationality. - Letting go expectations of the results after doing the level best. Thus offering the Self-inspired actions as one's contributions to the Universal Orchestration of the whole universe. And living in this world without the least trace of the ego-sense. - Combining one's Present Moment Presence (PMP) with the Presence of the Divine Presence Energy that underlies all beings and all things at all times (PDP). So that PMP and PDP becomes the infinite unified ONE in our day-to-day living of our lives. 1. Are you aware that you have the Inner Power of the Self in you and this power; being a part and parcel of the total creative process; is connected to the Supreme Universal Power that sustains the whole universe? 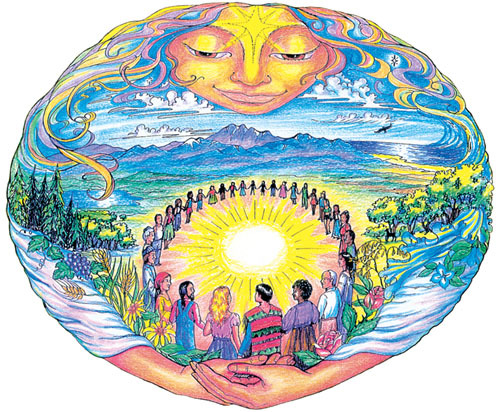 Just as, on a worldly scene, when an innocent child is connected with the mother, the enhanced co- creative process spontaneously/effortlessly begins to flow with a much bigger energy to make it happen. This connecting energy has so much of divine grace/assistance toward regeneration of the human effort that it is beyond one's intellectual imagination and its literary description as such. 2. Are you aware you are using this individual and universal power in whatever you are involved with? 3. Are you aware that; after doing your level best; you have freed yourself from an attachment to the outcomes you have performed to maintain your own freedom and inherent connection, as such? Your answers to these questions will guide you toward the areas you need to concentrate for developing the awareness you need. You may like to find them out in your own silent introspection and share your experiences as such with the LRIG members for further authentic dialogues/strengthening, if you so please.